ryanator008 wrote: If his views are so fringe, then why are so many people defending him? Everyone I disagree with is stupid or a cultist. Also they're all dudes, except the ones that aren't. And you wonder why people are so upset about SJWs. Well, that's rich. First of all, I have never said that I was wondering why people were upset about SJW. In fact, if you take a good look at the posting you "quoted", you will see that I identified another group of posters that acts in a way that I do not find justified, which you would probably call SJW (I wouldn't). When this all started, I was heavily arguing towards Playtonic not addressing this at all, that I fear this fuss over such a minor thing can only be harmful to the game. Also, there is a huge spectrum of opinions where I am opposed to, but which I would call neither stupid, nor the people carrying those ideas cultist. The current extremist right, yes, I would say that they have certain cultish elements, but in most democracies, including the German one, there is a large array of differences in opinions which I don't condemn in any way. E.g. in Germany, there are the parties CDU, CSU, SPD, Greens, Lefts, FDP and AfD, the only one you will see me condemning is AfD, the extreme right party. Even though I agree on basically nothing when it comes to the conservative parties CDU / CSU, you won't see me claiming any sort of mental defect involved with supporting their ideals. Regarding "dudes": It's fascinating that you call me anti-male, where I am male myself and within my political sphere (left-leaning green) I am probably an outlier in that regard as I oppose quotation rules for jobs, gender mainstreaming-type language policing and think representation in video games is a non-issue. That is, because I think the only thing important in a game is gameplay. Last edited by Yoshi on Sun Mar 26, 2017 8:12 am, edited 1 time in total. Alph wrote: I'm assuming what they meant based on the context. The subject at hand was racial and cultural diversity. "Of all forms" means all forms of racial and cultural diversity. Do you believe that they meant to convey that they celebrate all ideologies, no matter how violent, hate-filled, or atrocious? There's no logical reason to think that they were talking about that. I can say the same for Jon. And what do you know, he actually doesn't think like a racist. Alph wrote: What do you think Jontron meant? More importantly, what do you think Playtonic thought Jontron meant? What kind of viewpoint do you think Playtonic is being intolerant toward? I think he meant what he meant in the video he clarified his views on. Just like the people opposing the action Playtonic took, he is tired of political correctness, he doesn't like people labeling others and putting them into groups or categories, and he doesn't understand why white people get so much hate and why it's okay to hate white people. And people who deny what he was trying to say are either trying too hard to defend their political side or have been living under a rock. He's tired of the double standards held against white people and I'm sure he isn't the only one. And he has a valid point. If he was of a different ethnicity, I'm willing to bet he would not have gotten as much publicity for his statements. All the people who come under fire and get a ton of publicity are white people. Nobody bats an eye when Black Lives Matter activists start saying we need to start killing white people, but man you better be ready for a storm if those ethnicities were reversed. Even with Manveer Heir, who is most definitely a racist, people had to get a petition made to get him fired for his racist tweets about white people that he has been doing for I don't know how long. But you don't see news outlets covering that of course. "We won't allow differing political opinions affect the current state of our game. While we don't condone what JonTron is saying in any form, we do see how people could be upset if we were to remove him from our game as a result of this controversy. Instead, we will forgo any plans we have to collaborate with JonTron in the future." I did watch the newer video and I don't think JonTron is a racist. But he did say things in the other video that were racist, even if unintentionally so. Playtonic's actions were clearly meant to be anti-racism, not anti-conservative. What I hope is that Playtonic and JonTron can work out some sort of amends and move on from this. But in the meantime it helps no one to get into a frothing rage and try to cause a company to fail just because they tried to disassociate themselves from perceived racism. Jontron isn't in an outrage, after all. There doesn't need to be an outrage. 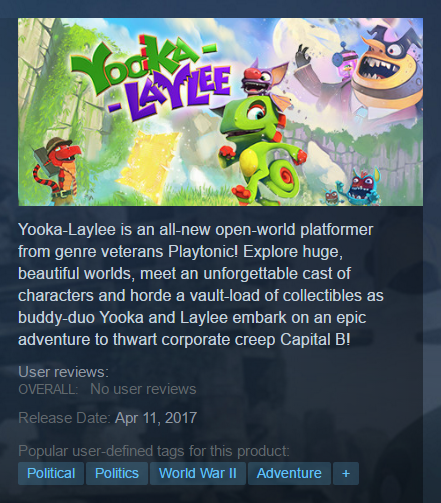 As someone who's spent the past two years literally lobbying for JonTron's Yooka-Laylee dismissal and was briefly on Playtonic's side when all this started, I still don't know why people think the big deal is that and not Playtonic's record-breakingly horrendous handling of damage-control that happened in the days following. It was Playtonic's idea pre-Kickstarter to get JonTron on board and make everyone aware of it. It was Playtonic's idea to start a relationship with these JonTronners and pretty much view their like as the target demographic. When you make an all-in statement on the matter like Playtonic did Thursday, you should be prepared to address concerns that some of your backers who you knowingly brought to the game BECAUSE they were fans of this person might have. While literal nazis are going on raids and NeoGAF is boiling over in its own hotbed of extremity (see the nurse who had the authorities called on them after the Playtonic thread encouraged them to admit premeditated malpractice on right-wing patients), Playtonic employees have been content hiding behind locked accounts while it all goes down. This combined with their knee-jerk timing is when it starts to suggest that Playtonic might not have any real conviction or confidence in their decision, and no stimulus beyond fear of NeoGAF further stalking its employees to analyze what eeeeeveryone at Playtonic tweeted during the Women's March. Yeah, Playtonic can't win, and someone is probably telling everyone there to shut up so that they don't wreak even more havoc (especially since they can't even change topics without accidentally referencing it! ), but putting out a PR statement of that magnitude only to in the days following pretend that backers against it don't exist and that none of this ever happened - the kind of corporate/consumer division that indie devs are supposed to be a cure for - is some of the most irresponsible behavior I've seen from a developer. Well, Jontron even made a statement that he understands the choice so somehow I think Playtonic and Jontron aren't having any kind of falling out at all. Playtonics' decision to remove the association does not mean they're not accepting of the person himself. While I hear people telling politics should't be in a game it's up to Playtonic how to interpret that really. They're an English company and they hold a different standard than most of the people I have seen getting angry over this. They do not agree with their take on this and aren't willing to be tolerable of their way to handle these kind of things. They think their entire gaming world took a blow because a single company decides to do things this way. Jontron wasn't really hurt and he took it alright. That's why I really dig the fellow. Even though he had controversial statements he Understands his mistake and moves on. Handful of people left who act like a paraditic leech of butthurtness attempting to make these kind of things way bigger than they are. Which they are not... well for a small group it might be but that is probably because they revel at the though of destroying that which does not allign with their own limited views. Which seems rather ironic as these people try to preach Playtonic is not a platform celebrating diversity at all, ironically they are the ones that are still unable to get over this. This will happen they're in for a foul time. I'd advise to be more accepting of small things and don't battle these things with a lot of hate. That won't make the arguments of being in the right end more believable. The reason why Playtonic locks their account is probably because they don't want to deal with death treats over this. People really go that far, it's kind of troubling really. That and they seem unable to move on normally as every comment box is spammed with butthurt people who are unable to move on. You don't hop on youtube, twitter, or steam forums much do you? Thousands of people are upset over this including a multitude of kickstarter backers. Go ahead and marginalize everyone speaking out against Playtonic, but we'll all be voting with our wallets on release date. JonTron didn't apologize for what he said, but for being a bad debater. He stood by his statements because they were based on statistical facts. Meanwhile the person he was debating, that led to this entire virtue signaling publicity stunt, claims that Japan is the most racist country in the world and communism was "just an economic thing." Of course there aren't dozens of articles being written about him, because he's an irrelevant twitch streamer that doesn't have over three million subscribers on youtube. Pretty stupid on Playtonic's part to piss off that audience when a large portion of them were interested in Y-L, BECAUSE of JonTron. As for the tweet regarding JonTron understanding why they had made this decision is based solely on the fact that there was literally nothing else he could say that wouldn't have backlash. Funny how the racist can let bygones be bygones, while the "tolerant" Playtonic is going to patch him out, make fun of and ban backers on steam asking for refunds, and leave a vague message that they support ALL forms of diversity. If you're surprised as to why they're receiving backlash, then there's no hope in you ever reaching a reasonable conclusion as to why. Last edited by DiverseOpinions on Sun Mar 26, 2017 10:08 am, edited 1 time in total. Rawk wrote: As someone who's spent the past two years literally lobbying for JonTron's Yooka-Laylee dismissal and was briefly on Playtonic's side when all this started, I still don't know why people think the big deal is that and not Playtonic's record-breakingly horrendous handling of damage-control that happened in the days following. I feel like I should be surprised by how, I guess stalkerish, they got over Playtonic and their employees, but nothing really surprises me these days. They even jumped to a conclusion with what Stevenson said about games and politics. This is why we can't have nice things. Oh I do understand, but I don't sympathize with them really. It's not surprising what kind of people fall over this mostly. Kind've like how nobody sympathized with you when you randomly announced that you were autistic in this thread when it held absolutely no relevancy to the discussion? Or are you just going to PM me more harassing me and telling me to leave this forum when I have every right to be here just as much as you do. Please do post the whole of all messages I sent to you. As I don't want bring other people in OUR little dispute. Also you are pathetically trying to attack me everytime on the person. Why exactly? Just stop it. I specifically meant people who weren't intending to buy the game anyway. The post where I used my autism was rather fitting, as we autistic people appear to have difficulty with our communication skills. But sometimes I really DO wonder who is having difficulty with that. Last edited by Yavga on Sun Mar 26, 2017 10:30 am, edited 2 times in total. Damda wrote: children arguing on the internet. You're right. Thanks for waking me up. I'm going to do some other things that are more productive. Yavga wrote: Oh I do understand, but I don't sympathize with them really. It's not surprising what kind of people fall over this mostly. I think there is a difference between the people who pressured Playtonic into removing Jon and those who are upset about the removal. Those people who pressured Playtonic are the people who push all of this political crap in the first place. I'm disappointed Playtonic caved, and I've lost respect for them. And I had so much respect for them before. But I have no doubt the game will be well made, and I can at least support that. DiverseOpinions wrote: Kind've like how nobody sympathized with you when you randomly announced that you were autistic in this thread when it held absolutely no relevancy to the discussion? Some of what I've seen you say doesn't help to prove a point nor does it give constructive criticism, and your entire last comment doesn't help your side of the debate in anyway. Insulting people, regardless of how condescending they can be, does nothing to help the conversation or prove your point. It's a bunch of useless fluff that has no place when debating topics. Were they really pressured into doing that? Removing the cameo? That might change my view somewhat as I always thought it was their own decision. Do you have a source? Okay guys, can we stop replying to things we already replied to and that get repeatedly brought up nonetheless? Every effort is wasted and it's just hurting to see it going on and on. I unfortunately cannot confirm that as I'm making an assumption. However, the evidence is there. Members of NeoGaf became a little stalkerish with some of the Playtonic employees, Playtonic didn't decide to do this until more than a week after the incident, and apparently what made Playtonic become aware of Jon's comments was a bombardment of emails they got asking for Jon to be removed from the game (or that's what someone claimed anyways). No evidence to support the last point, but I'm sure Playtonic would have been aware of Jon's comments shortly after the incident since it was a pretty hot topic. I was expecting the whole thing with Jon to settle down and not have to hear of it everywhere, but then this happened. So let's assume you're correct. The thing Playtonic would be guilty for is just not having a backbone (yet) instead of political charged motivations. Can't we just forgive them that? I mean they're a new indie company (regardless of past experience with the industry, it's a clean slate with new management) perhaps they just wanted to play it safe and they didn't think about the backlash. So yeah, it would be wrong but does it justify all the hate? I don't hate my girlfriend after I have had an argument. We make up and look to the future. Yavga wrote: So let's assume you're correct. I'm not in complete outrage over it. However that doesn't mean I haven't lost some respect for them. 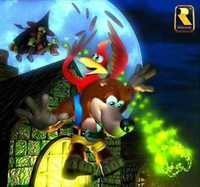 When they left Rareware and decided to make their own company, I had a lot respect for them. They were sticking it to the big companies and making a statement that people still want these types of games. I believed they had a backbone and would just keep doing what they wanted to do, regardless of what's going on in the world. Perhaps the pedestal I put them onto was too high. I can still support them for developing a polished and well designed game, and to not put any microtransactions in or cut content to sell as DLC. No company is perfect, but the company that has a backbone has become a unicorn. Or is from Japan.